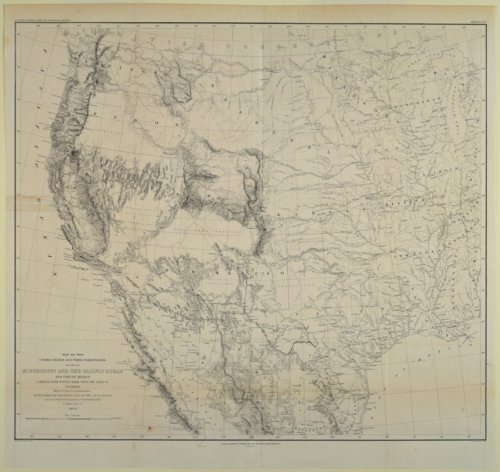 Map of the United States and its territories between the Mississippi River and the Pacific Ocean compiled from surveys made under the order of U. S. Commissioner W. H. Emory and from the maps of the Pacific Railroad, General Land Office, and the Coast Survey. The map was projected and drawn under the supervision of Lt. Nathaniel Michler by Thomas Jekyll. Regions south of the border with Mexico are also included. This map is provided through a co-operative project between the Lecompton Historical Society and the Kansas Historical Society. Partial funding was provided by the Ross and Margaret Wulfkuhle Charitable Trust and the Freedom's Frontier National Heritage Area.